Red-white bicolor. Sources: Staack 1997 and Stadler 1964-1971. Nürnberg became a city in 1219 and became one of the most important cities in present Bavaria. The city uses two different arms; the greater arms with the eagle with a king's head and the lesser arms with the eagle and red bends. Both were adopted in 1936. (...) The lesser arms are known as the real arms since 1240, where they are first mentioned. The arms showed a shield divided in five bends silver [white] and red. The arms are probably derived from the arms of the first viscounts of Nürnberg. (...) During the centuries the number of bends changed regularly and were finally fixed in 1936. 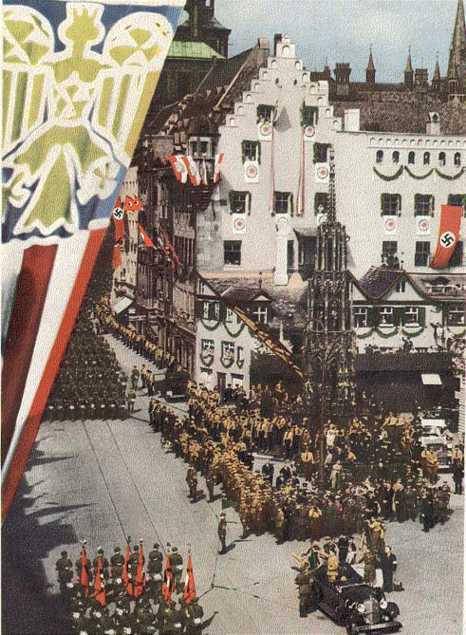 There is a photograph in this website of Hitler reviewing a parade in downtown Nuremberg in 1938. It shows a close up of a vertical flag, red and white stripes with in the upper part a plain blue square with a golden eagle. Is it a Nuremberg flag? Obviously it is a Nuremberg city flag, yes. The city colours are red-white, and therefore the flag (as quite usual a hanging flag) is striped in these colours. Furthermore the arms is shown, here in a field at the top of the flag. The arms shows a golden eagle [with crowned, human head] on blue (see the International Civic Arms website). The arms in this flag is more stylized than usual, though.